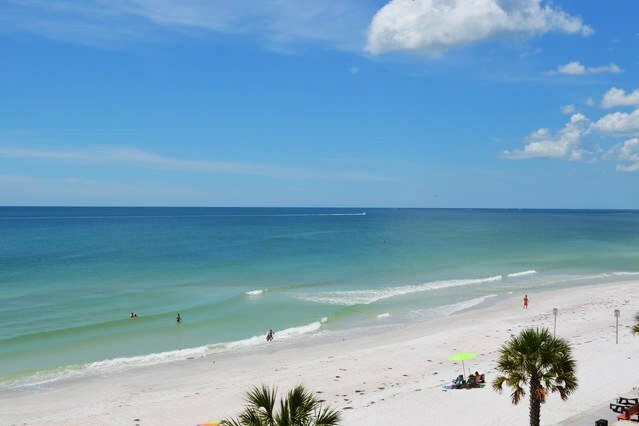 TREASURE ISLAND VACATION RENTAL PERFECT BEACHFRONT VIEW in this Sunset beach 1 bedroom/1 bath condo. Beach and pool is right there!! no far walks... This condo features an updated, clean kitchen, living and dining room combo~enjoy beach and sunset views from inside condo~queen sleeper sofa, love seat, cable tv, breakfast bar and dining room~newly remodeld kitchen features dishwasher, microwave, stove/oven, full refrigerator, coffee pot, blender~nicely stocked for a comfortable stay; a spacious bedroom, queen bed and plenty of closet space; full bath/shower combo, bath/beach towels, linens included. Please contact me with information regarding Sunset Chateau 410. "Great view of the beach and very convienent of those bathroom breaks for the kids. Great little restaurant within easy walking distance. The other people who live there were also really nice. The only thing I would have liked would have been a slightly thinker mattress for the hide a bed. My son had a hard time sleeping on it because of how thin it was. We had a great stay!" Review #16609056 "Sunset Chateau- Gulf Front 1BR w/POOL"
Just wanted a place to stay for a short visit over New Year and this one was in the area I wanted to stay. Although there was a little mis-communication with the renting agent we got that resolved only to have the key break off in the door when I was going to eat but that was fixed by the time I returned. 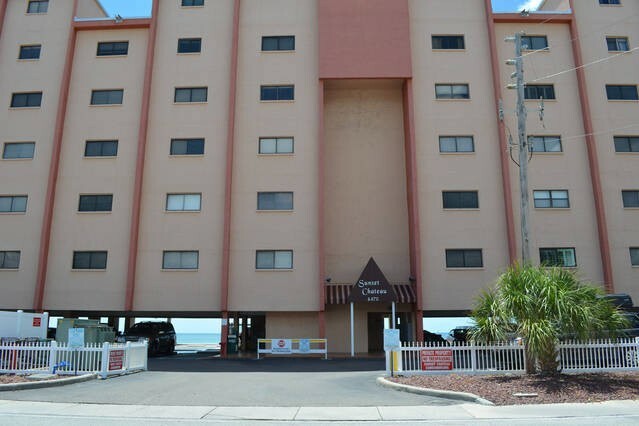 The unit is located on the 4th floor of a multi-storied building located right on the ocean beach. The building is undoubtedly a condominium as my neighbors were all staying for a couple of months and were repeat customers. 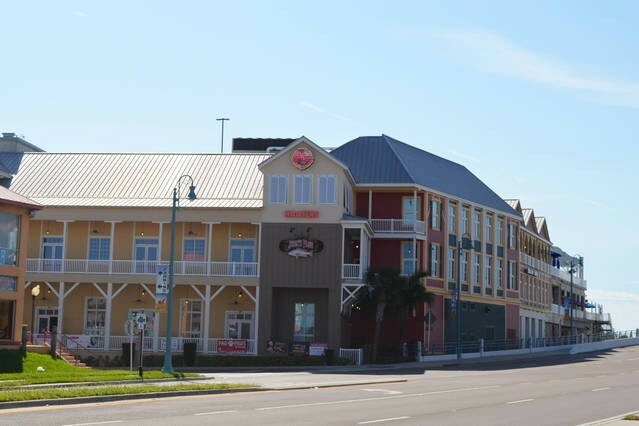 The building was quiet and was located on West Gulf which has no outlet so traffic noise was non-existent It is located within walking distance from Caddy's Bar and Grill and there are numerous eating establishments within a short drive. I would consider the facilities as adequate for one or two people, especially for such a short stay. I did not use the kitchen so I have no review of that aspect. The bedroom is on the East side of the building and the blinds would not be adequate to keep out the daylight during days with an earlier sunrise. 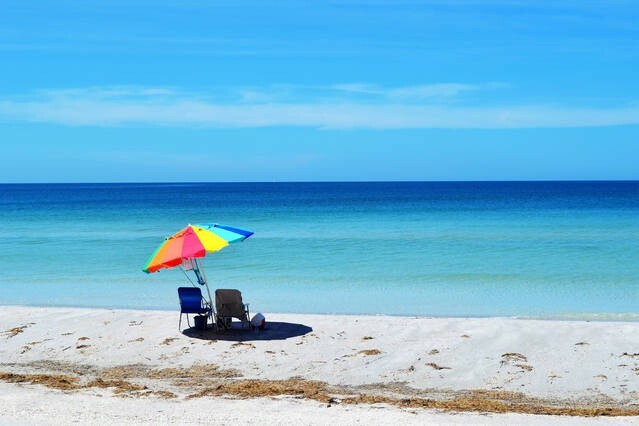 Certainly, the best asset of this place is its location right on the beach where one can watch the sunsets right from the deck and listen to the surf all night long. Parking was an asset as there were plenty of spaces available. If this were a hotel I would rate it as 3 stars. We spent four days here prior to a cruise in Feb 2018 and would have loved to have stayed longer. The beach was fabulous and the views from the front were amazing. We walked to a couple bars and listened to some amazing live music on the beach; the sand was like talc powder. The rental was fully equipped with everything we needed including beach chairs. The kitchen appeared to be newly updated and was really nice. The bathroom needed some TLC but was clean. Plenty of excellent restaurants in Treasure island, Medeira Beach and St Pete’s Beach. Would stay here again in a heartbeat!